Where Are The Victoria Falls? 355 feet tall and also known as Mosi-oa-Tunya ("thunderous smoke"), Victoria Falls lie along the border between Zimbabwe and Zambia. Sun sets upon the Victoria Falls along the Zambia-Zimbabwe border. Victoria Falls has a height of 355 feet and is more than 3,281 feet in breadth. That wide span is close to three-quarters of a mile long. It is the largest waterfall in the world, and it is also known as Mosi-oa-Tunya by the local tribes, meaning “The smoke that thunders.” The roar of the waterfall is evident from as far away as half of a mile. 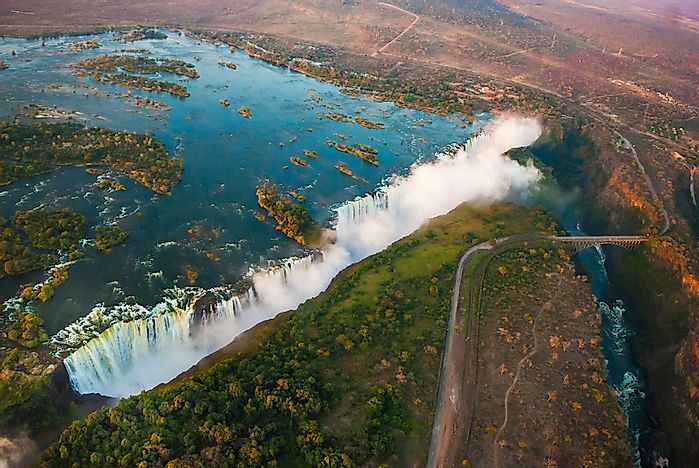 Victoria Falls is situated between the African nations of Zimbabwe and Zambia. It has several islets that divide its waterflow as it drops down the edge of its fall line. The waterfall is at its most thunderous during the rainy season in April, and declines to its lowest flow during October and November. In 1855, the Scottish missionary Dr. David Livingstone gave the name to the waterfall in honor of Queen Victoria of England. By 1900, Europeans had started to trickle into the area, and white settlements were built. The British South Africa Company established its presence on the Zambezi side of the river. The company engaged in logging, animal skins, and the ivory trade there. In 1904, tourism became a major activity in the area, with what are now northern Zambia and southern Zimbabwe under British colonial rule. At that time, the town of Victoria Falls was the jumping off point for tourists in the area. The area also experienced the Zambia Bush War in 1972, when Zambezi guerrillas managed to cross over into the Zambia side, which lasted for several years before peace returned. Zambia reopened its borders only in 1980. Tourism has always been a part of Victoria Falls, at least from the time that the first Europeans reached the area. During the 1990s, around 400,000 tourists visited the region every year, most of whom were from Zambia and Zimbabwe. It also has cross-border tourism from both sides. The Victoria Falls National Park and Mosi-oa-Tunya National Park are both located in the surrounding areas of the waterfall. The Victoria Falls town is on the Zimbabwe side, and sits right on its western edge. The years between the 1930s and the 1960s, and then again from the 1980s through the 1990s, were boom years for the town, as tourists arrived by the thousands. Helicopter tours, elephant rides, safari rides, and bungee jumping are notable parts of tourist activities in the region. Other outdoor activities here include game fishing, kayaking, horseback riding, and whitewater rafting. There are several national parks directly in and around the Victoria Falls area, as well as throughout the surrounding vicinity. The habitats there include teak woodlands, scrubland savanna, and woodland savanna. Low vegetation are also part of the flora. A rainforest thrives immediately next to the waterfall, nourished by its extensive water sprays and moisture. The river below the falls has around 39 fish species, while on the river supplying the falls above there are around 89 fish species. Other fauna in the Victoria Falls and its surrounding national parks are cheetahs, antelopes, leopards, lions, monkeys, baboons, buffaloes, giraffes, and zebras. Native birds there include Fish eagles, herons, waterfowls, falcons, and buzzards. Hippopotamuses and crocodiles also abound in the river above the falls. The United Nations Educational, Scientific, and Cultural Organization declared the Victoria Falls to be a UNESCO World Heritage Site in 1989. This honor gives it protection as embodied in an international treaty in 1972. In the early 2000s, Zimbabwean President Robert Mugabe instituted a land reform program close to the area that to some extent negatively affected tourism on his own Zimbabwe's side. Zambia relished this, as tourism on its side of Victoria Falls rose to new highs. In 2009, environmental groups complained about the noise pollution in the vicinity of the waterfall, as more and more airplane flights were being allowed to pass immediately over the falls. Noise pollution and carbon emissions from the constant helicopter flights over the area prove to be a nuisance that could adversely affect the native fauna. The many complaints could also lead to the waterfalls being stricken off the list of UNESCO sites.